It’s been over a hundred years since movies first came to the towns and cities of Alberta. Early short black and white silent motion pictures carried subtitles or inter-titles, frames of script interspersed with the action. The 10 to 15 minute reels shown on hand-cranked projectors started up jerkily and ended with a flapping sound as they flew off the reel at the finale. While the managers of “legitimate” theatres, as the newspapers dubbed them, believed the movies would never compete with live shows, their comparatively low price soon made them popular. Despite the reputation of movies as “low-brow” entertainment, specialized movie houses sprang up in urban areas. The movie business was a competitive one from the outset: by 1913 there were twelve theatres in Edmonton that showed movies. Soon dubbed nickelodeons, after the 5 cent admission price and the Greek word for theatre, they proved to be financially successful. Edmonton’s Bijou that opened downtown around 1908 in converted retail premises filled its tightly-packed rows of wooden seats. Offering a two reel show using a hand cranked projector, each screening featured an educational reel with a short comedy followed by a full reel length feature. The manager Bill Hamilton explained the action on the screen and a small orchestra or pianist played during intermissions as the projectionist rewound the reels. In 1910 the Bijou rushed in a reel of King Edward’s funeral from London and played it for six days, accompanied by Chopin’s Funeral March on the piano. Palace Theatre, Calgary, Alberta, ca. 1925 (Glenbow Archives NA-446-132). Albertans were hooked on movie going from the start. The experience ranged from hard kitchen chairs in the plain Innisfail Opera house to plush seating in lavishly decorated theatres. 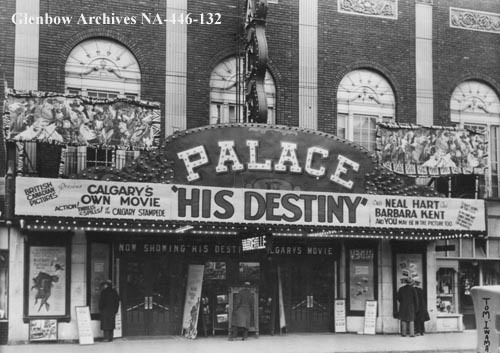 In Calgary, the Canadian chain of Allen Theatres built Alberta’s first “real picture palace” in 1913. The Allen Theatre, later known as the Palace Theatre, had 840 luxurious seats, a large balcony and an organ for musical interludes. By 1915 movie goers in Edmonton could enjoy a similar experience in plush seats under lavishly decorated plaster friezes and painted tableaus in the marble-fronted Princess Theatre. Competition from the movies pushed the Pantages, Edmonton’s highbrow vaudeville palace, into near bankruptcy in 1920. It was reborn in 1921 as the Metropolitan, advertised as “a high-class motion picture theatre,” with continuous performances from 11 am to 11 pm. Admission prices ranged from 10 cents for a children’s matinee to 45 cents for adult evening ticket in lounge or box seating. Rural Albertans also developed a taste for the movies. Itinerant projectionists travelled between villages and towns to show movies in schools and community halls. By the 1920s busy towns boasted their own cinema, such as the Crowsnest’s Grand Theatre in Frank and the Orpheum in Blairmore. These cinemas played the same movies as in urban centres, but offered fewer screenings. During the silent movie decade of the 1920s movie goers showed a preference for American movies. Despite the Allen chain’s promise of “Canadian Pictures for Canadian People,” American films dominated Canadian screens. Nevertheless, Calgary movie-goers relished the low budget, locally produced movie His Destiny. It stared Barbara Kent of Gadsby, Alberta, alongside Neal Hart, screen star of silent westerns, and was shown at the Palace in 1928, thanks to the introduction of a preferential quota for films made in the British Empire, which was ultimately unsuccessful. Elsewhere in Alberta His Destiny was not a hit. From the outset movie-goers decided what they wanted to see and theatres provided it. (Provincial Archives of Alberta, A5462). And then came the excitement of the “talkies,” the first motion pictures with sound. First introduced in New York in 1926 by Warner Brothers, they took urban audiences in Alberta by storm two years later. The world was never the same as movies came into their own. The expectations and experiences of movie goers were transformed, much as we have been by the internet. Theatres invested in expensive sound equipment, which needed constant attention and adjustment for optimum results. In Edmonton the Princess theatre showed the first talkie; crowds lined up in August 1929 to see The Canary Murder Case. By November 1929 when Edmonton’s Dreamland installed sound, the Journal provided detailed explanation of how it worked, noting the city’s theatres were “100 per cent Talkie Now.” By 1930 no one in Alberta wanted silent movies and theatres ceased showing any live performance along with motion pictures in the same program. The golden age of movies had begun. Through the 1930s movie-going offered Albertans, many of whom were out of work, something to do for a few cents, and it was a way to forget harsh economic reality and miserable weather. The movie houses lowered their prices and used a number of tactics to encourage patrons to part with their limited funds. Raffles, gimmicks and prizes lured movie goers. Posters and advertising for films carried melodramatic flare, whether they offered romances, comedies, tragedies, westerns or mysteries. Elaborate front-of-house themed installations on sidewalks stopped passers-by and at night flickering tracer lights beckoned. 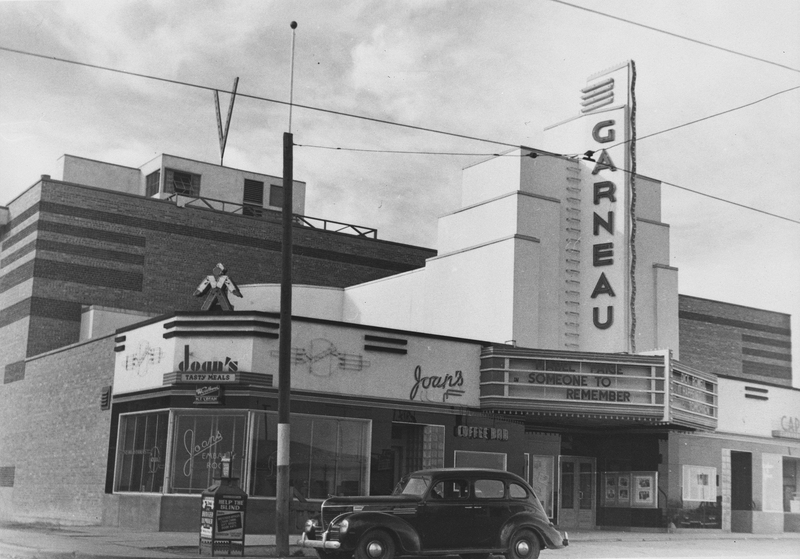 The Garneau Theatre, Edmonton, 1943 (Provincial Archives of Alberta, A6885). By the 1940s the wartime economy fueled the love of cinema to greater heights. Surviving older multipurpose theatres such as the Empress Theatre in Fort McLeod experienced a new lease on life as a movie theatre. Bashaw’s Majestic Theatre, built in 1915, which had operated as a silent picture house through the 1920s but subsequently fell on hard times, reopened in 1945 as the Dixy. At the same time cinemas began to move out of the downtown core. In Edmonton two rival theatres appeared on the south side in 1940, the Varscona and the Garneau Threatre, both designed specially as cinemas in the modernist Art Deco style that was emerging in the city and across the province. At the Garneau fashionably uniformed ushers escorted patrons to their seats, which included a new twist—“two’s company” love seats for young couples. Movie theatres continued to evolve in architectural style (or lack thereof ) and taste in films changed, too, over the next decades. Technology has brought us ever more exciting experiences. But the buzz is still the same—on a Saturday night it’s clear that Albertans are still hooked on movies. The Archaeological Society of Alberta, incorporated in 1975, is an amateur organization committed to promoting, protecting and preserving Alberta’s heritage. The Society is one of five provincial heritage organizations that receive annual funding from the Alberta Historical Resources Foundation. The Society is currently made up of over 400 members, organised into six centres: Strathcona (Edmonton and area), Bodo, Red Deer, Calgary, Lethbridge and Southeastern (Medicine Hat). Membership in the Society is open to anyone with an interest in archaeology and it provides great opportunities for people of all ages to get involved in actively experiencing, promoting and protecting Alberta’s archaeological resources! Artifacts brought into a “Stones and Bones” event hosted by the Lethbridge chapter of the ASA, March 2014. Photo courtesy of John Easton. The Society facilitates public outreach programs and supports archaeological research across Alberta. Its programs include Speaker Series, workshops, fieldtrips, “Stones and Bones” events and an annual conference and general meeting that consists of a full day of speakers, a poster session and a day long fieldtrip. Professionals from the Archaeological Survey of the Historic Resources Management Branch often assist with, and participate in, Society events. 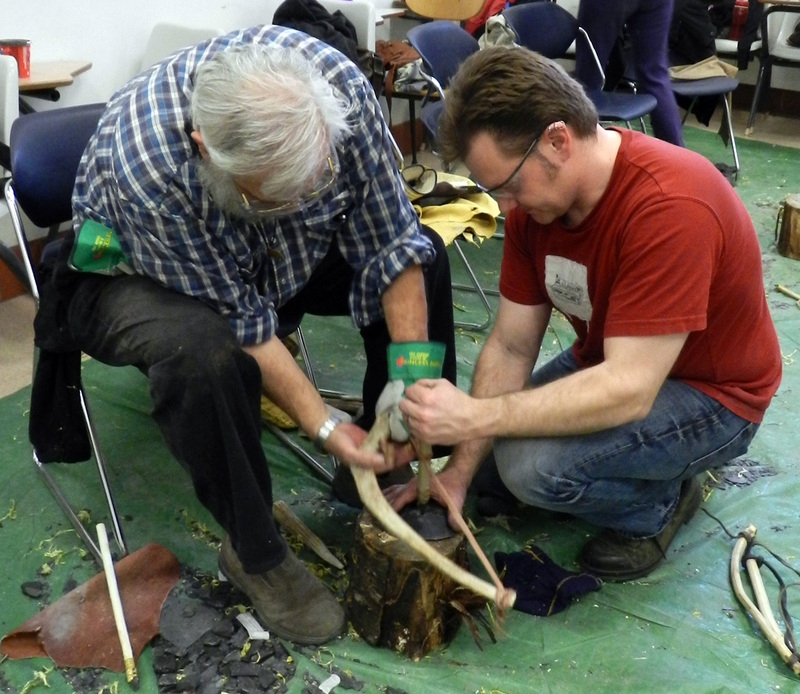 Members of the Strathcona society making their own stone tools at the March 2014 flintknapping workshop. Photo courtesy of Kurtis Blaikie-Birkigt. Speaker Series takes place from fall to spring and highlight Alberta archaeology through a monthly talk given by a professional archaeologist. The Strathcona centre is currently collaborating with the Edmonton Telus World of Science by offering the Speaker Series in conjunction with the Indiana Jones exhibit! Recent workshops have included flintknapping, artifact casting, historic artifact identification and artifact illustration. These workshops are day long or weekend events that teach people traditional and archaeological skills. The flintknapping workshop is one of the most popular events. Expert flintknappers from across the province and country teach members how to make their own stone tools using traditional methods of striking two rocks together and using antler tines to refine the shape of the tool and its edges. Nothing is more satisfying than being able to craft your own projectile point! “Stones and Bones” events provide a venue where avocational archaeologists, collectors, and the public can bring their artifacts in to be identified by professionals. This often results in valuable archaeological resources being revealed that enhance the archaeological record of the province. 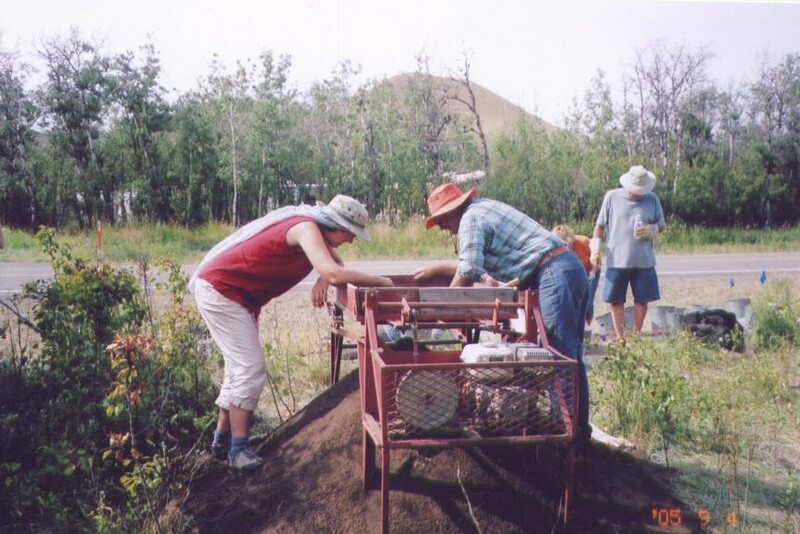 Fieldtrips to all types of sites including medicine wheels, effigies, bison jumps and pounds, and ceremonial sites allow an opportunity for Society members to visit archaeological sites and sometimes witness an active excavation. Members of the Southeastern centre on a field trip to an effigy site in southern Alberta. Photo courtesy of Janice Andreas. In addition to these programs, the Society provides funding and volunteer assistance to research projects undertaken by centres, educational institutions or individual members that enhance the knowledge and protection of Alberta’s historic resources. This includes archival research, excavation, or the survey of archaeological sites. 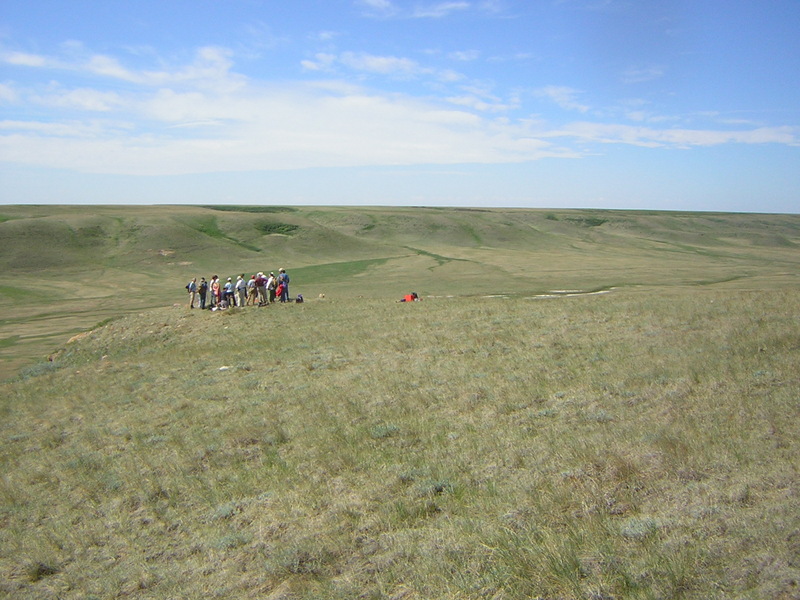 Recent research this grant program has supported includes mapping of the Glenbow Town and Quarry site by the Calgary Centre, ongoing excavation at a bison kill site in Bodo and a survey of the Forks region in southeastern Alberta by Society members. All of this research has incorporated public participation by welcoming members to lend a helping hand. Society members volunteering at an active archaeological excavation. Photo courtesy of Janice Andreas. In addition to hands-on activities, the Archaeological Society of Alberta produces several archaeological publications. The Alberta Archaeological Review, published bi-annually since 1977, provides news of the Society’s activities and a forum for the presentation of archaeological research in Alberta. 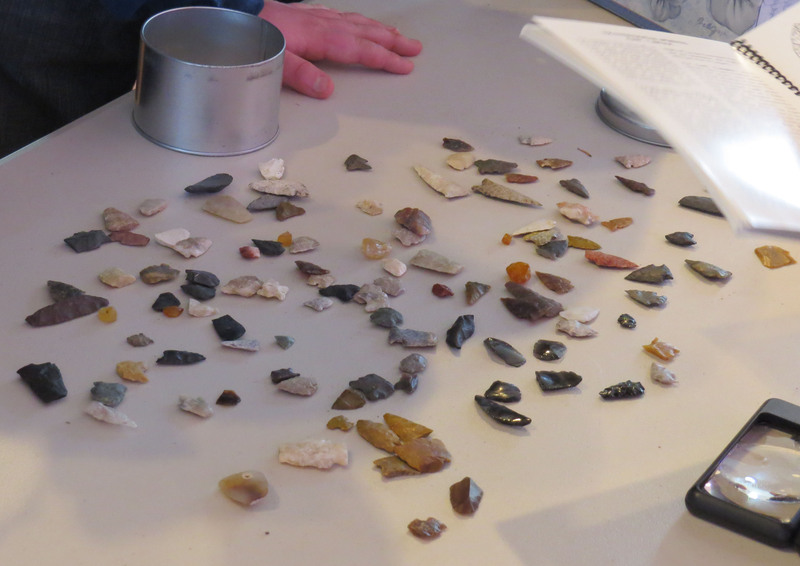 The Society also publishes archaeological reports and papers and has produced several versions of the popular book “Record in Stone: Familiar Projectile Points from Alberta” which outlines projectile point typology of the province. Support from the Alberta Historical Resources Foundation makes it possible for organizations like this to carry out their mandates and create new initiatives to engage the public and make our province’s culture and heritage accessible to everyone! The foundation receives money from the Alberta Lottery Fund that is used to provide financial and technical assistance to community based heritage projects including several Provincial Heritage Organizations, like the Archaeological Society of Alberta, that deliver programs and services that document, preserve and present the province’s heritage. Click on these links for more information about the Alberta Historical Resources Foundation and the Archaeological Society of Alberta. Edmontonians have been talking about extending the LRT system for a while now. The completion of the Metro line as far north as NAIT is the first segment of a planned extension past the city limits and into St. Albert. It’s still on the drawing board, but it’s worth remembering it’s been done almost a hundred years ago. 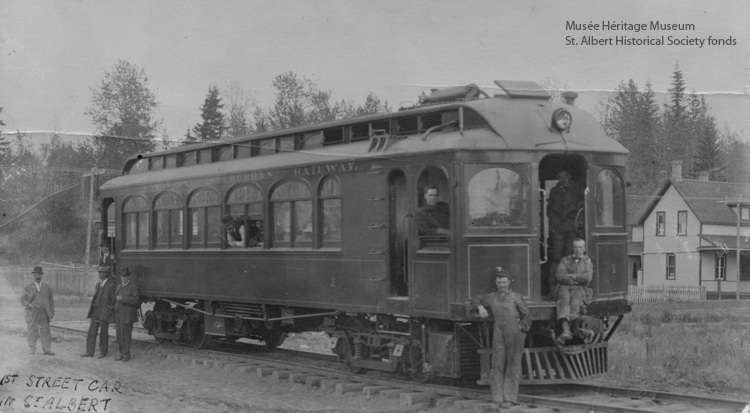 Yes, believe it or not, there was a commuter rail line to St. Albert before the Great War. In 1910 Financier Raymond Brutinel, who had a home on the St. Albert Trail and an eye to make a buck in real estate along the route, acquired a charter for the all-electric Interurban Railway. The company reorganized in 1912 through an agreement with the Franco-Canadian Corporation; the vice president was well-known Edmontonian J.H Picard. The Interurban Railway thought big—not only was there to be a line to St. Albert, but other lines to Beaver Lake and Tofield, Pigeon Lake, and Namao. Construction to St. Albert began in 1912 and by late summer, seven miles had been graded. The Interurban track was nearing completion by mid-summer 1913. Sidings were constructed every mile or mile and a half, to be used for the loading and unloading of freight, and to provide passing points for the cars. A car barn was erected at Queen Mary’s Park near 137th Avenue and 124th street. By the time the company was ready to go into operation it could not afford the electric grid. Instead it ordered a number of unusual hybrid-drive rail cars. Interurban railway, ca. 1913-1915 (Musée Héritage Museum, St. Albert Historical Society fonds, 2003.01.795). 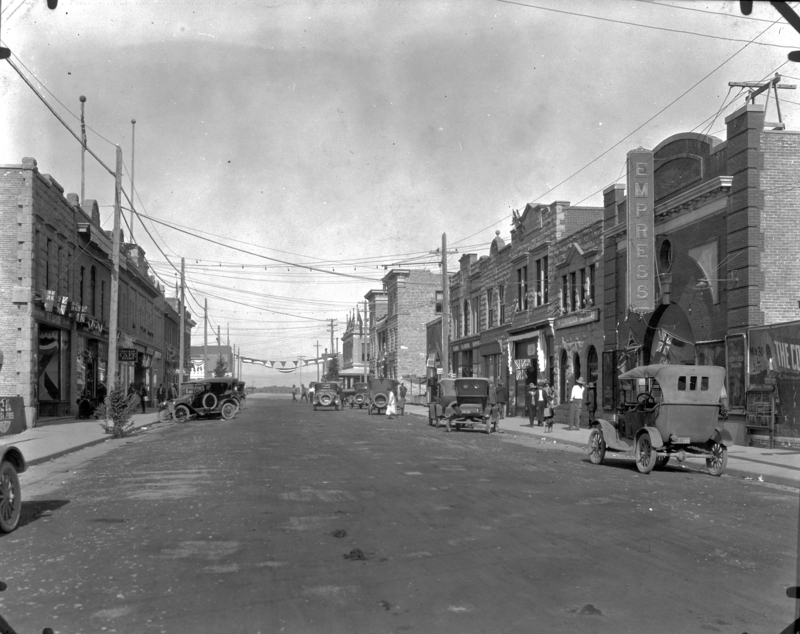 The route, which took 45 minutes each way, connected with Edmonton Radial Railway street cars at 24th Street and Alberta Avenue. One could get on the interurban in St. Albert, travel to the terminus at 124th Street and then transfer to the Edmonton Radial Railway’s red and green line, whose route eventually went over the Low Level Bridge to Whyte Avenue and returned over the High Level Bridge. Unfortunately, the Interurban was destined to be short lived. The service was not profitable: the hybrid car suffered breakdowns, making the schedule unreliable. Passengers transferring at 124th street often had a long wait. Soon after it was up and running Edmonton plunged into economic recession. The Interurban limped along until a fire on April 1, 1914 destroyed the Drake in the barns at St. Mary’s Park. The Twin City Transfer Company saw an opportunity and quickly offered auto bus jitney (taxi) service from Edmonton to St. Albert. The Interurban Railway Company, still without a second car, talked about rebuilding to operate with electricity, but the economic climate and war precluded such a vision. In 1916 the Edmonton Radial Railway took over a portion of the tracks to serve the Calder yards. Plans to get the Interurban running again were last floated in 1917, as the Franco Canadian Corporation was in a better position to bargain with the City of Edmonton. “The city council is likely to be quite tractable and reasonable. Our main lever in securing an advantageous agreement is the fact that we are now renting to the City 1.4 mile[s] of our track, where the development of the traffic to Calder has been so great that the city would not now interfere with a service that has become a public necessity.” Nothing ever came of it and the remainder of the line was torn up. St. Albert commuters still rely on the bus, their eye on the future when electric rail will finally be realized. An interesting post script to this story is that while the Drake burned in the 1914 fire, the McEwan Pratt car, when it eventually arrived in Alberta, ended up on the Lacombe and Blindman Valley Electric Railway (like the Interurban it was never electrified). The details of this transfer of ownership are a little mysterious, but it was hauling passengers to Gull Lake by 1917. Evidently not very successful on that line, it was replaced by 1919. It resurfaced in the historical record in 1928—in the Canadian Pacific Railway Ogden Yards in Calgary on its way to be scrapped. Unfortunately, although CPR workers noticed its unusual design, no one thought to preserve it as an Alberta rail anomaly. Facebook, Twitter, blogs and other types of social media can connect heritage conservationists throughout the world. We sometimes get so focused on the brick, stone or wood that we forget that successful heritage conservation is built on relationships between people, according to Kayla Jonas-Galvin, a heritage planner based in southern Ontario. Social media websites allow user to create and share content with each other. 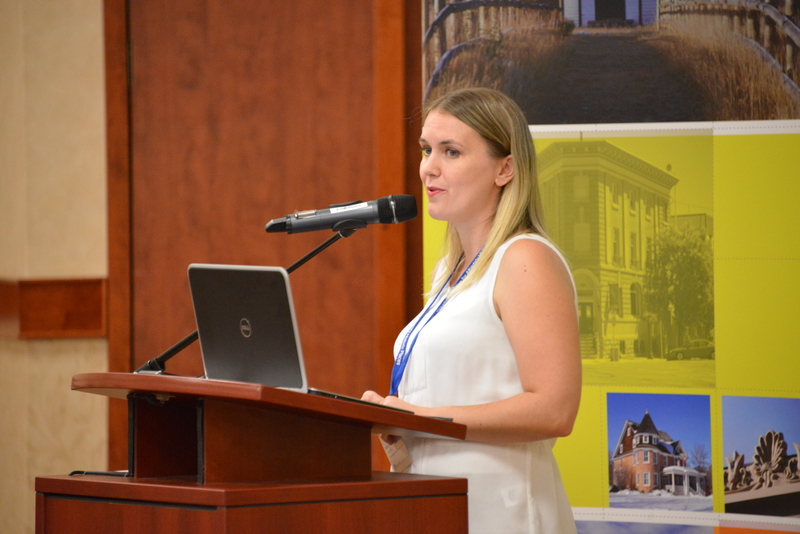 In her keynote address at the 2014 Municipal Heritage Forum in Lacombe, Kayla highlighted the many ways social media enables communication between heritage professionals and members of the public. Kayla speaks from experience. She has worked for the Heritage Resources Centre (at the University of Waterloo), the Architectural Conservatory of Ontario and ARA Heritage. She finds that social media is a key tool in promoting heritage conservation. She is responsible for, among other things, founding the #builtheritage twitter chat – a twitter chat sponsored by the U.S. National Trust for Historic Preservation. What started as a small group of heritage conservationists discussing heritage and conservation issues quickly grew into a large international discussion that drew in many people beyond hard-core conservationists. Kayla emphasised that social media shouldn’t be complicated—it’s just another way to have a conversation. It’s an opportunity to talk to several people, often separated by vast distances, as though they were sitting in the next room. With this in mind, Kayla founded #builtheritage twitter chats to spark discussion of heritage conservation issues with people outside Waterloo. She started the chats by simply tweeting a few people that she was interested in talking to about problems of conserving historic places. The chats quickly grew to attract conservationists from all over the United States, Canada and around the world. People who had never met were suddenly talking to each other about the problems and opportunities they faced when trying to conserve historic places in their own communities. Anyone could participate and in time many people who normally did not think about heritage conservation were suddenly involved. At one point, Gloria Estefan replied to a tweet about the Miami Marine Stadium. So how do we use these tools? Kayla emphasised the importance of setting goals. Who do you wish to reach and what do you want to say? Facebook and Twitter (just two examples) connect people in different ways. Twitter’s short text messages allow large groups of people to chat in real time, while Facebook allows users to share and comment on pictures and weblinks with friends easily. Kayla related stories about how social media is bringing heritage preservation into the mainstream. There are many groups on Facebook that love to share old photos. The Vintage Edmonton Facebook page currently has over 11 000 followers. Hundreds of people who probably don’t consider themselves heritage conservationists share pictures and stories of Edmonton’s history. To be effective, says Kayla, it’s important to have personality and to talk to other people. Don’t treat social media channels as just as a means of delivering announcements—talk to people. Social media is another avenue to start a conversation. If we all encourage people to share photos, sound records and videos we’re probably going to be surprised by the number of people who want to discuss our common heritage. We need to start asking ourselves what about my heritage can be shared over social media and who do I want to share it with. You can start the conversation over at the Alberta’s Historic Places facebook page, the @ABHistoricPlace twitter feed or by commenting on this article. Mewata Armoury (Provincial Archives of Alberta, P.4017). Plans for an elaborate armoury in Calgary were well underway prior to the outbreak of the First World War, as the need for a permanent, military training structure was apparent within the first decade of the twentieth century. The story of the construction of Calgary’s own armoury was a drawn out affair that lasted to nearly the end of the Great War. There were problems from the very beginning, including fierce opposition to the cost and chosen site of the armoury, a shortage of building materials and ultimately the outbreak of war. In the end, the result was a state of the art facility with a central drill hall surrounded by 117 rooms and complete with dining hall, shooting gallery and even a bowling alley. 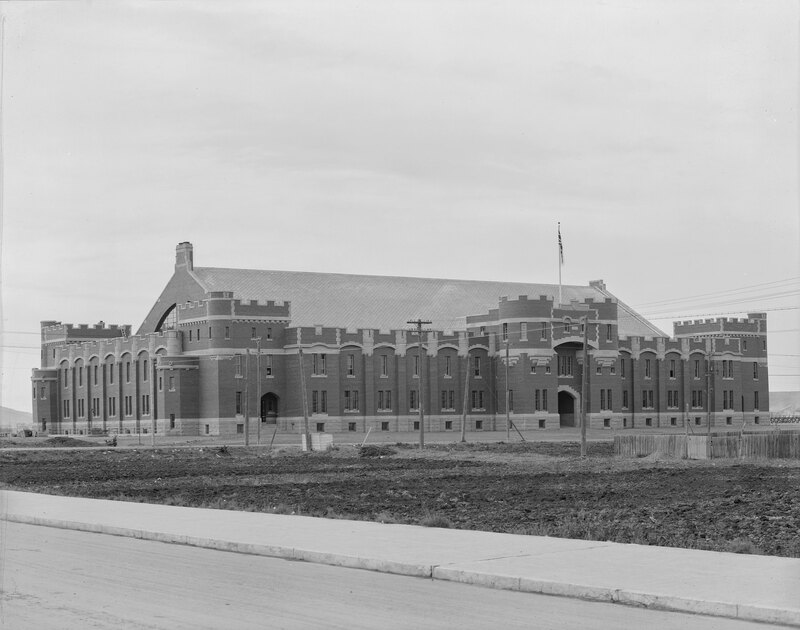 This post will examine the Mewata Armoury, a building that was established during the First World War, and its place as a significant symbol of military heritage in Alberta. In the early 1900s, the Canadian military underwent a number of reforms to modernize it and establish permanent facilities for the army. The federal government set the ambitious goal to establish 350 new drill halls and the decision to construct these served a dual purpose. These structures were to foster a sense of military pride amongst Canadians while boosting recruitment and create a closer connection between civilians and soldiers. Calgary was considered part of Ottawa’s military expansion plan early on and the city became the headquarters for Military District No. 13 in 1907, which covered all of Alberta and the district of MacKenzie (a portion of the Northwest Territories at the time). This declaration was significant since it meant that the area was deemed to be an important part of the future of the Canadian military. It was nevertheless the local military regiments, and not the federal government, that took it upon themselves to push for the construction of a new armoury. Calgary was growing rapidly in the early twentieth century and they felt they needed a facility to house their growing regiments. The city’s military organizations wanted a building that would better accommodate their soldiers and approached the federal government for approval to build an armoury in Calgary. Potential sites for the location were suggested over the next few years, but were all deemed insufficient and plans for the armoury were soon shelved. 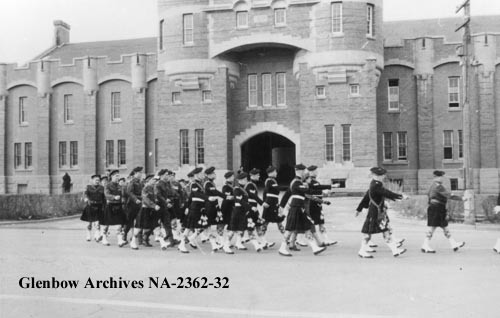 Calgary Highlanders pipe band parading by Mewata Armoury, Calgary, date unknown. (Glenbow Archives, NA-2362-32). It was not until Sam Hughes was appointed Canada’s Minister of Militia and Defence in 1911 that Ottawa’s plans for a modern militia were put in motion. Hughes undertook the responsibility of reforming Canada’s military and his ambitious agenda included the construction of armouries and drill halls across the country. Hughes promoted the volunteer soldier as the foundation of the Canadian military and believed that volunteerism was the most viable form of recruitment. He was also a strong supporter of building a shared place for civilians and soldiers. This belief was reinforced by the need for an armoury, as it would serve as a visible presence to foster civic pride, and in turn, increase the number of soldiers who enlist. In addition to providing an adequate space for training, the new structures were to be a permanent symbol of Canada’s military reform program. Another supporter of this vision was the Calgary Conservative MP, Richard Bedford Bennett. Bennett agreed with Hughes’ plan for an elaborate military structure and wanted Calgary to have its own armoury. One of Bennett’s first decisions upon taking office was to lobby the federal government to establish such a facility. Although the city already held a number of rented military buildings for training purposes and used school grounds for parades, these sites were spread throughout Calgary and it was considered more practical to consolidate these into a single location. The city also remained without a permanent indoor space for military training during the winter months. Bennett considered this to be inadequate for a growing city and the proposal for an armoury was revisited. It took minimal lobbying on Bennett’s behalf to convince Hughes that Calgary was worthy of a magnificent armoury and the funds were soon allotted to begin building. When it came to deciding on the location for Calgary’s armoury, Bennett had just one area in mind, Mewata Park. The site was already being used as an athletic field and had originally been designated a civic park for the people of Calgary. The site was centrally located, which meant that it would be impossible for the structure to be missed by many Calgarians during their daily commute downtown. Mewata Armoury Provincial Historic Resource, Calgary. (Alberta Culture, Historic Resources Management Branch, 2000). As the plans for the new armoury proceeded, the project was met with opposition, notably from Alberta Liberals, who felt that the federal government had no right to devote public land to a military institution. They also raised concern over the cost that would be incurred to construct the new building. The daily pro-Liberal newspaper, Morning Albertan, voiced their opinion against the construction of an armoury, citing that “an expenditure of such an amount would be a lavish and inexcusable waste of money.” However, this did not appear to be the sentiment of the majority of the citizens of Calgary. The opposition was soon squashed by people who came out in strong support of the armoury during the 1913 municipal election. This was a heated election issue that year and included a question on the ballot enquiring if citizens wanted to see the project move forward. More than 70% of voters were in favour of constructing an armoury at Mewata Park, indicating their support for the local military. In 1916, supporters were granted their request and the City of Calgary donated the land to the federal government to build the armoury. The First World War erupted in August of 1914 and the armoury’s construction was therefore delayed for a few years. This was due to the city’s resources being allocated to more necessary and immediate projects for the war efforts. A brick shortage contributed to construction being deferred even further. Building was eventually underway in September, 1916 and was finalized in the fall of 1918. Once completed, the armoury was used as a training centre and demobilization depot for soldiers returning from WWI. Although it was too late for the armoury to be fully utilized for the war, the construction of an impressive military facility helped to encourage pride among its citizens. Although the armoury’s interior has been remodelled substantially, the exterior has retained its original appearance as constructed in 1916. The building is one of only two similar structures in the province (the other being the Prince of Wales Armoury in Edmonton). The architectural design is a classic example of the gothic and Tudor revival, which was built to look like a fortress with its four corner towers and six smaller side towers. What makes the Mewata Armoury unique is its castle-like style, massive size and the use of brick and sandstone construction. This is one of the last buildings in Calgary that was created with sandstone. Mewata Armoury remains a long-standing military landmark and shows the federal government’s commitment to a militia-presence in Calgary. A number of regiments have called the armoury home over the years, including the Calgary Regiment’s First Battalion (currently the Calgary Highlanders), the Second Battalion (now the King’s Own Calgary Regiment) and various cavalry units. 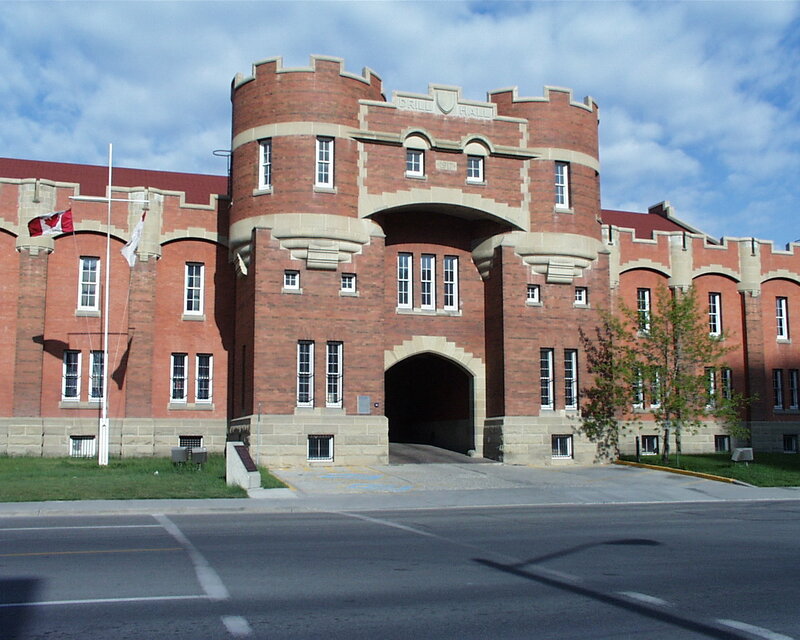 Mewata Armoury has primarily been used as a military facility, but has also been a training centre for the police, a base for numerous Cadet Corps and is the headquarters for the Southern Alberta Militia District. Various sporting events have been held at the armoury and Mewata Park was still used as an athletic field. The armoury remains an important site, as it was constructed to connect the military with the civilian population, amidst the First World War. This was the third part of a series commemorating the First World War. This series will look at a range of topics that will show Alberta’s involvement in this historic event. Designation File # 177, in the custody of the Historic Resources Management Branch. Lackenbauer, P. Whitney “Partisan Politics, Civic Priorities, and the Urban Militia: Situating the Calgary Armoury, 1907-1917.” Urban History Review 33, no. 2 (2005): 45-60. “Mewata Armoury” Alberta Register of Historic Places. HeRMIS. (Accessed August 12, 2014). Rowe, Allan “Historical Context Paper Mewata Armoury (Calgary),” Historic Resources Management Branch, Des. File #177. (April 25, 2014). In Jasper National Park there are five mountains named for First World War Victoria Cross recipients with Alberta connections. The peaks are located within a series of mountains known as the Victoria Cross Ranges. The names of these mountains honour Private John Chipman Kerr, Private Cecil John Kinross, Captain George Burdon McKean, Private John George Pattison and Sergeant Raphael Louis Zengel. The Victoria Cross was established in 1856 by Queen Victoria to recognize military personnel who demonstrated bravery when faced with the opposition during wartime. It is the highest military decoration that can be bestowed upon a soldier in the British Commonwealth. This post will look at the recipients of the Victoria Cross who the mountains in Jasper National Park are dedicated to. 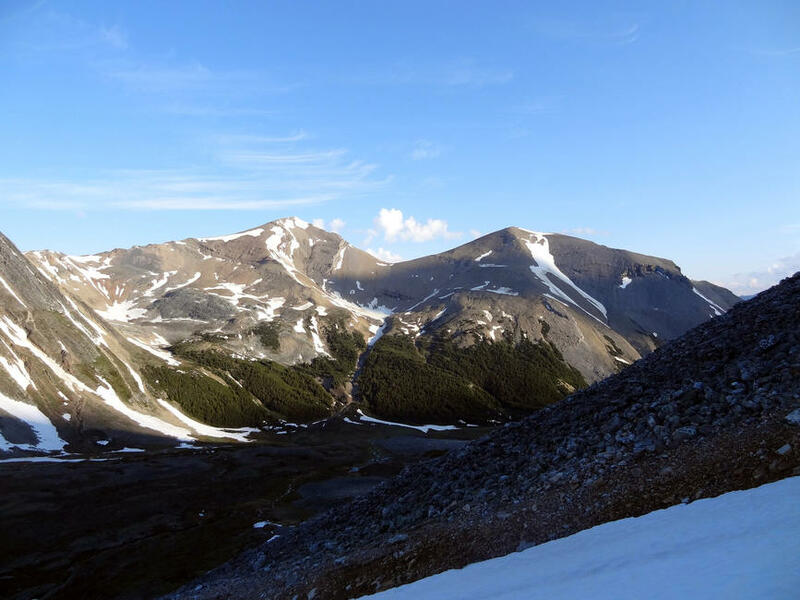 Mount Kerr is named in honour of Private John Chipman Kerr, who served in the Alberta raised, 49th Battalion (Edmonton Regiment), Canadian Expeditionary Force. Kerr, originally from Fox River, Nova Scotia, moved to Spirit River, Alberta before enlisting for service in 1915. 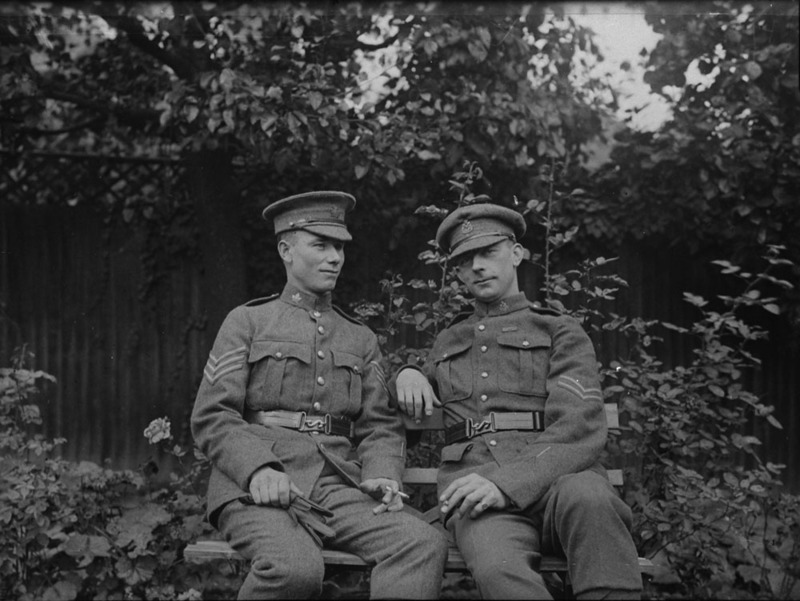 J. C. Kerr (right) c. 1914-1919 (Credit: Canada Dept. of National Defence/Library and Archives Canada). On September 16, 1916, during the Battle of the Somme, Kerr and his unit prepared to ambush German soldiers. As the lead bayonet man, Kerr was 30 metres ahead of his comrades and exchanged fire with enemy troops. The Germans, believing that they had been surrounded, surrendered to Kerr. Sixty-two prisoners were captured and 250 yards of enemy territory was seized. Kerr was injured and lost a finger in the attack, but reported back for active duty before the wound had been fully dressed. For his actions on that day, Private Kerr was awarded the Victoria Cross. After the war, Kerr returned to farming, worked in the Turner Valley oil fields and as a forest ranger. He enlisted in the Second World War and transferred to the Royal Canadian Air Force. John Kerr died in Port Moody, British Columbia in February 1963. His Victoria Cross is displayed at the Canadian War Museum in Ottawa. Mount Kinross was named for Private Cecil John Kinross. Originally from England, he had immigrated to a rural Alberta farm with his family at the age of 16. He enlisted in the 51st Battalion, Canadian Expeditionary Force in 1915 and later transferred to the 49th Battalion in France. C. J. Kinross c. 1914-1919 (Credit: Canada Dept. of National Defence/Library and Archives Canada). On October 30, 1917, during the Battle of Passchendaele in Belgium, Kinross’s unit was under intense artillery fire. Showing no concern for his own personal safety, he took off alone and charged towards the enemy, killing six soldiers and destroying their machine gun. His action inspired his comrades and their unit to advance 300 yards into enemy territory. Kinross was severely injured in the battle and did not return to the front lines. Kinross received the Victoria Cross for his act of bravery that day. His citation announced “he showed marvellous coolness and courage, fighting with the utmost aggressiveness against heavy odds until seriously wounded.” Private Kinross was honourably discharged and he returned to Lougheed, Alberta, where he lived until his death in June of 1957. His Victoria Cross remains with his family and the miniature is on display at the Loyal Edmonton Regiment Museum in Edmonton. Mount McKean (Courtesy of Mountain Nerd on Summit Search). Mount McKean is dedicated to Captain George Burdon McKean, who immigrated to Canada from England in 1902 to join his brother on a farm near Lethbridge. He studied at Robertson College, a theological school in Edmonton, and was an assistant minister at the time of his enlistment in 1915. 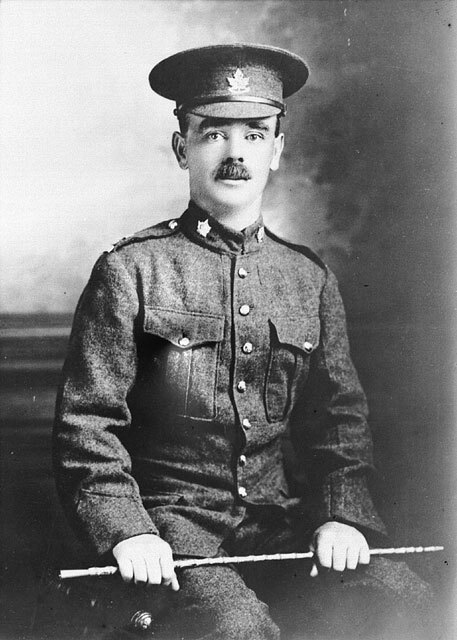 McKean first enlisted as a Private in the 51st Battalion, Canadian Expeditionary Force and later became a Lieutenant in the 14th battalion (Royal Montreal Regiment). G. B. McKean, 1918 (Credit: Canada Dept. of National Defence/Library and Archives Canada). In addition to the Victoria Cross, McKean also received the Military Cross and the Military Medal for his service during the war. He was later promoted to Captain. After the war, he returned to England. He was killed in an industrial accident in November 1926. In addition to being commemorated by Mount McKean, in 2003, a public square in Cagnicourt, France was named La Place George Burdon McKean. His Victoria Cross is in the collection of the Canadian War Museum. 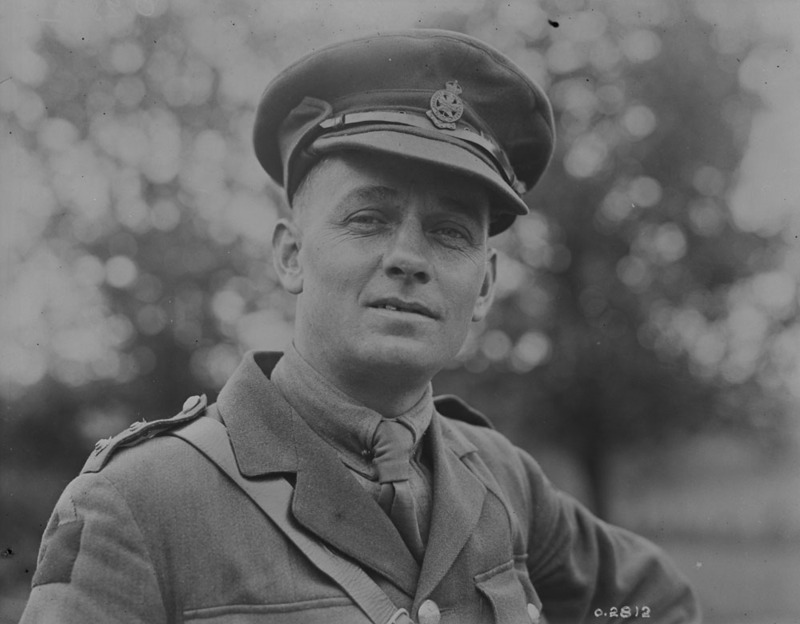 J. G. Pattison c. 1914-1919 (Credit: Canada Dept. of National Defence/Library and Archives Canada). Mount Pattison is dedicated to Private John George Pattison. He was born and raised in England and moved to Canada in 1906 with his wife and four children. He worked for the Calgary Gas Company. In 1916, at 40 years of age, he enlisted in Calgary with the 50th (Calgary) Battalion, Canadian Expeditionary Force. In April of 1917 at Vimy Ridge, the 50th Battalion was advancing towards German occupied territory when they were confronted with heavy machine gun fire. Pattison charged forward to face the opposition and hurled grenades at the enemy which allowed him to take out the remainder of the German crew. He was awarded the Victoria Cross for his actions and credited with making further advances possible. 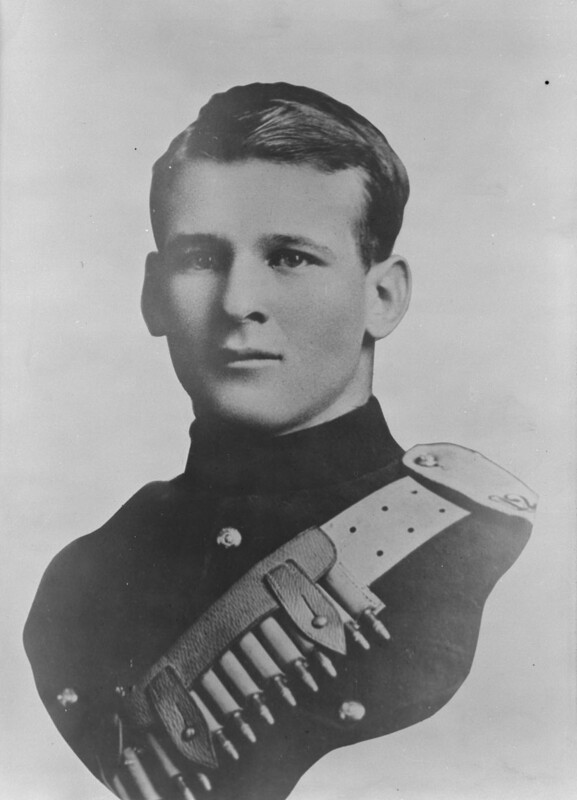 Pattison was one of four Canadians to receive the Victoria Cross at the Battle of Vimy Ridge. A few weeks later, Private Pattison was killed in action on June 3, 1917, during an attack on a German occupied power station in Lens, France. In addition to the mountain named in his honour, Pattison Bridge over the Elbow River in Calgary commemorates his service and sacrifice. R. L. Zengel c. 1914 (Credit: Canada Dept. of National Defence/Library and Archives Canada). Mount Zengel is named in honour of Sergeant Raphael Louis Zengel, who came to Canada from Minnesota at a young age. The Zengel family initially settled on a homestead in Saskatchewan before Raphael enlisted to the 45th (Manitoba) Battalion, Canadian Expeditionary Force in 1915. He later became a sergeant in the 5th (Western Cavalry) Battalion. On August 9, 1918 near Amiens, France, on the second day of a massive campaign against German forces, Sergeant Zengel’s platoon came under heavy machine-gun fire. He rushed ahead and met the defensive unit, killing two of their machine gunners and forcing the others to scatter. He was cited for his excellent work through the attack and for showing utter disregard for his own personal safety. Sergeant Zengel was awarded the Victoria Cross for his contribution at the Battle of Amiens. (He had previously been awarded the Military Medal for his service at the Battle of Passchendaele). After the war he became a long-time resident of Rocky Mountain House, Alberta. He died in February 1977. Branch No. 8 of the Royal Canadian Legion in Rocky Mountain House is named the R.L. Zengel V.C. to commemorate his award distinction. In 1936, the Geographic Board of Canada named Zengle Lake in Saskatchewan in his honour, misspelling his name in the process. Mount Zengel on the right (Courtesy of Mountain Nerd on Summit Search). The tribute to these soldiers in 1951 was made possible by the co-operation of federal and provincial governments. However, at the time, the proposal created controversy. 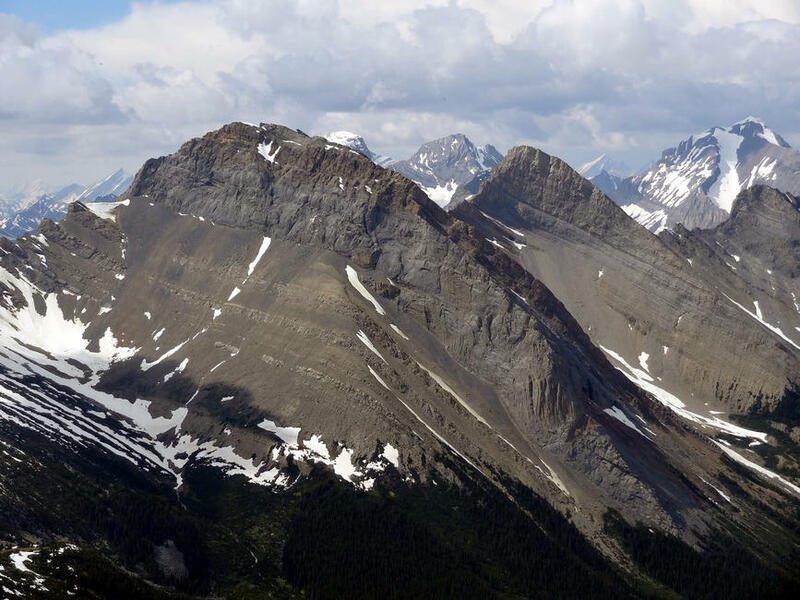 The issue’s resolution would bring about the creation of the Victoria Cross Ranges and an agreement between the Governments of Alberta and Canada still governs geographical naming in in Alberta today. That will be the subject of our next place names post. For more information on soldiers who served in the First World War, Library and Archives Canada provides digital records on the soldiers who enlisted in the Canadian Expeditionary Force. Canadian Great War Project. (Accessed August 21, 2014). Geographical Names Program Research File #83-D/16, Jasper Park. In custody if the Historical Resources Management Branch. Geographic Board of Alberta Minutes: March 28, 1946-November 19, 1949. Geographic Board of Alberta Minutes: January 22, 1950-December 17, 1954. Library and Archives Canada. “Soldiers of the First World War: 1914-1918.” (Accessed August 22, 2014). National Defense and the Canadian Forces. “Canada’s Victoria Cross.” (Accessed August 29, 2014). National Defense and the Canadian Forces. 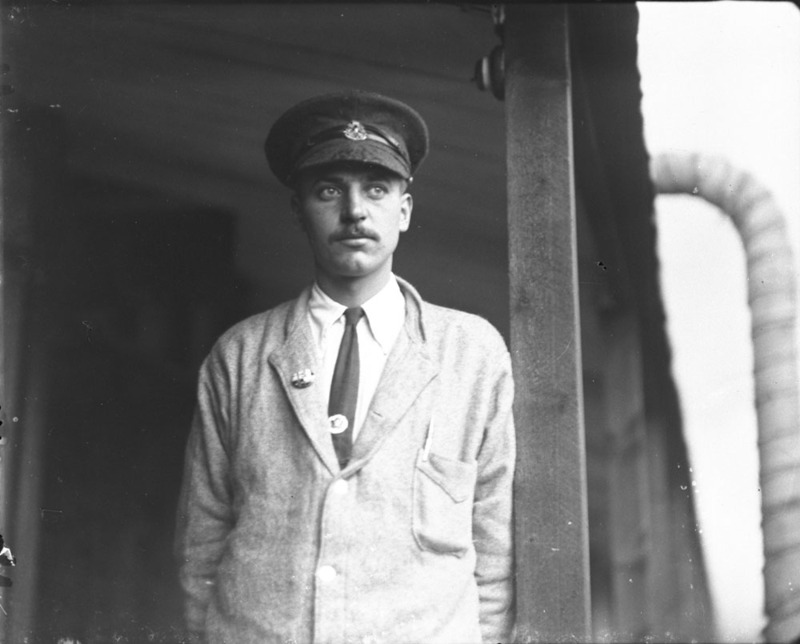 “Victoria Cross – First World War, 1914-1918.” (Accessed August 21, 2014). Nix, James Ernest. “McKean, George Burdon.” Dictionary of Canadian Biography, vol. 15, University of Toronto/Université Laval, 2005. (Accessed August 29, 2014). Peak Finder. (Accessed August 21, 2014). Summit Search: Mountain Community. (Accessed August 29, 2014). It’s when the grain is ripe for harvest in late August or early September that I miss going to our local Alberta Wheat Pool elevator the most. Jumping off the combine and going to the elevator to have its friendly agent, Bill, run a moisture test on a grain sample and discuss the state of the crop was one of my jobs on the farm. When I arrived in Alberta in the 1980s, drinking coffee and shooting the breeze with the neighbours while the elevator agent was busy, was part of the culture, but the old-timer grain farmers could smell change the air. How right they were. 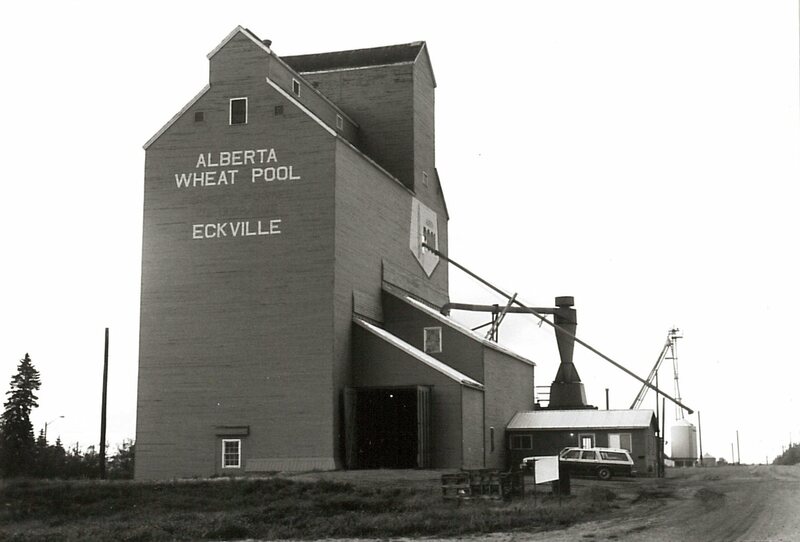 Our closest local elevator, a single composite wood crib facility constructed in 1963, at Eckville, closed in 2001. Since then we rarely visit an elevator. Now we have our own moisture tester, analysis market conditions using the internet, and have our grain trucked from the bins in the yard to the inland terminal at Lacombe or further afield—selling grain over the phone and having it trucked to a concrete silo is not much fun! In past decades farmers were in and out of the elevator office in a rhythm that reflected the farmer’s seasonal activity. A major reason to go to the elevator was to update the permit book, which kept a record of the type, quantity and grade of grain delivered as well as the number of acres seeded to various grains, and the acreage assigned to each grain for quota purposes. Canadian Wheat Board regulations required that all grain sales, even to local users, be recorded in the permit book. The permit book had its origins in the quota system on cereal grains introduced during the Second World War. Beginning with the crop year 1941-1942, farmers were only able to deliver limited amounts of grain, based on their acreage, at certain times. The quota system, administered by the Wheat Board, was designed to prevent the clogging of the grain handling system at a time when production exceeded available markets. It continued after the war in an attempt to give each producer an equal opportunity to sell his or her grain at the Wheat Board price for the crop year. A farmer’s pay check and hence his loyalty to one grain company over another was ultimately determined by whether he could get space in the elevator to deliver his quota of grain. If there was room, some farmers preferred to haul to the Alberta Wheat Pool or United Grain Growers elevator, lured by the promise of patronage dividends on deliveries in relation to the companies’ profits for the year. Many farmers made a point of being at the elevator office often, not only to find out what was going on but to establish a good relationship with the agent. They sometimes helped out when the agent was especially busy. In years when the harvest was plentiful, railway box cars were often in short supply and elevator storage space was limited, bonds of friendship, along with a reputation for reliable delivery and honesty might ensure one’s grain would be taken in before the neighbour’s. There were a thousand and one reasons why a farmer might be at the elevator other than when he was delivering grain. He bought coal and flour throughout the year, seed in the spring and from the 1950s, fertilizer. He might be in to check prices, find out if there was space in the elevator for his grain or pick up a cheque for grain previously delivered. Farmers needed the use of the scale at the elevator for inter-farm grain sales, and the elevator agent usually obliged. There was no need for a business excuse to go to the elevator. On wet days farmers dropped in to see who else was there, play crib or just to complain about the weather. 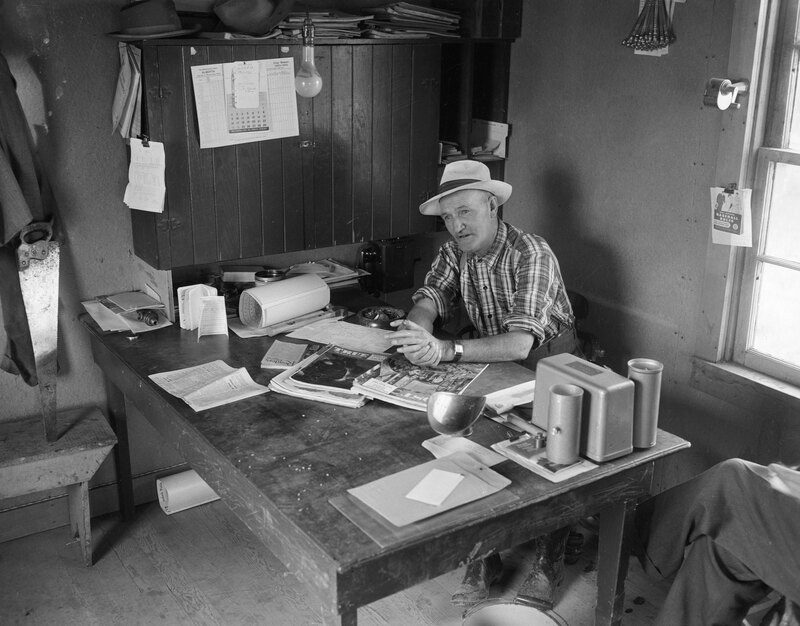 The elevator office was a good place to catch up on local gossip: who had bought a new tractor, who was selling out, who was renting land from who, and to gauge the relative condition of neighbouring crops, as well as shifting land and machinery auction prices. Farmers gravitated towards the elevator they dealt with and elevator agents played host to groups of farmer-customers in their cramped offices during visits to town. The elevator agent, urged on by his company to network and increase sales, was part of the community, involved in social and sporting events. At Forshee, a long forgotten elevator siding between Rimbey and Bentley, Harry Proudfoot, a U.G.G. agent from 1946-1968, was a member of several athletic teams, and helped his farmer neighbours during haying season and other times when grain deliveries were slow. Back in the 1930s when elevator agents often had the only radio in the district, broadcasts were a lure for farmers, who might hope to catch more than the day’s grain prices. In the 1990s farmer went to the elevator to catch the farm weather cast and to watch world-wide commodity trading on cutting-edge computers. The farmers gathered whiled away hours discussing every farming topic under the sun. The agent would go off to receive a load or two of grain, and they would often still be there when he returned from the driveway. 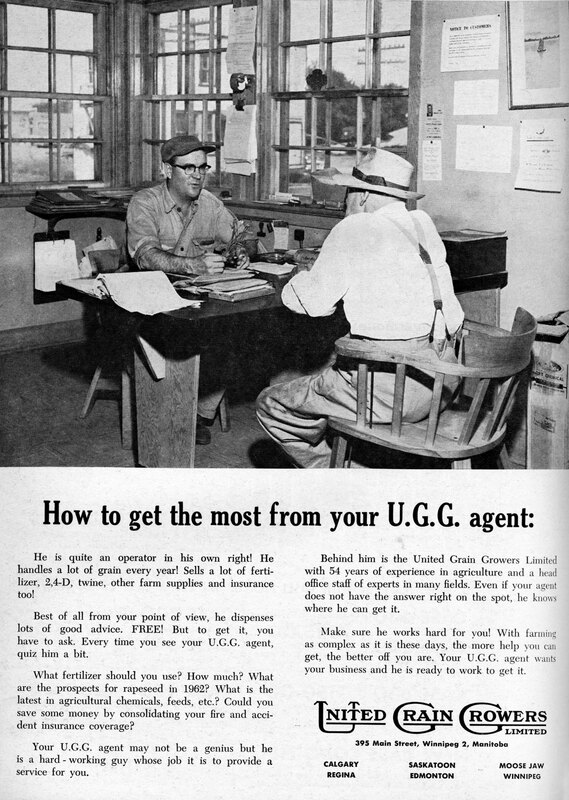 From the mid-twentieth century, much of the farmer’s economic news, social connections, information about the latest cropping practices, and even family activities and entertainment came through the elevator office as grain companies vied to be foremost in the farmers’ lives and keep their business. 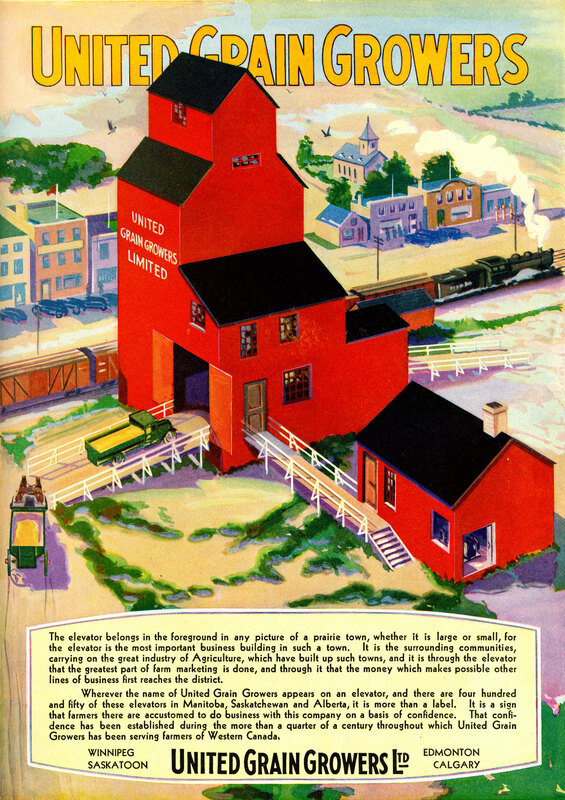 All grain companies, especially the farmer-owned Alberta Wheat Pool and United Grain Growers, pushed the image of the grain elevator as the stable symbol of rural life. It ended for us in 2001. We knew it would happen. We saw elevators topple all over the province after 1995. When Eckville went down in a cloud of dust we did not go to watch. Now in 2014, the Canadian Wheat Board is no more: there are no quotas, no permit book. We market our own grain. Like so many others in the farming community we have lost a connectedness with fellow grain producers and direct involvement with the grain handling system that really was centred in the elevator office.